In early 2017 Zede and Mal made the tough decision to close the retail storefront of the business. It was a time filled with many emotions, long work hours, and lots of exhaustion. Sewpporters to the rescue! Zede and Mal were showered with thoughtful and encouraging cards from around the globe. If you were one of the sewpporters stay tuned, because each week the ladies will have special thank you’s and shout out’s to you all. Zede and Mallory give a complete run down of how the Made to Measure Leggings Class is structured and what you can expect from the class. 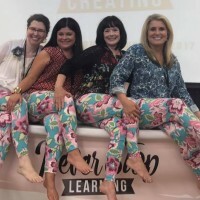 They share how the class is tailored to every stitcher, novice to pro and how the leggings can be put together in a variety of ways from serger to coverstitch, to only sewing machine -they show you the way. Most importantly, they really rave about the drafting process. After all- these leggings are made to measure. So where can you learn to measure, draft, and construct your own leggings? 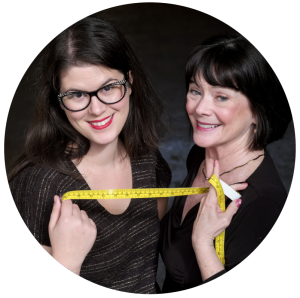 Right here of course – Made to Measure Leggings Class! The first wave of Boxes will ship in early July 2017. If you ordered after June 21st, your box will ship by the end of July. When checking out, please choose “SewHere Box Shipping” to ensure free shipping for your package. Refunds will not be issued if shipping is charged on your order. Join in the SewHere Box fun, yet again! 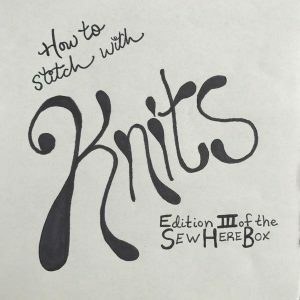 This time we’ve curated a ton of products to help you sew with knits. Knits are the most comfortable and popular type of fabric to wear, but can be challenging to sew. If you use the right tool for the job, you can add tons of knit garments to your wardrobe in no time! Of course, the SewHere Box will include special goodies and surprises that are ONLY available to box purchasers! If you were wowed last time, rest assured that we’ll impress you again! Here are SOME of the items we have picked out for the box, but we may yet add more! Duckbill scissors for trimming coverstitched and double-needle hems! EXCLUSIVE SewHere merchandise designed by Mallory and our team! Plus exclusive online content about how to sew with knits from Zede and Mallory!